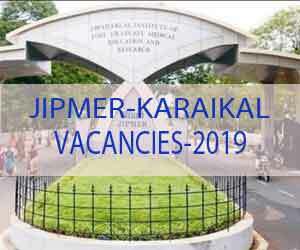 New Delhi: The Jawaharlal Institute of Postgraduate Medical Education and Research, Puducherry (JIPMER Puducherry) has released 60 vacancies for the posts of Professor and Assistant Professor on Regular Basis. The eligible candidates can send their application on or before 01 May 2019. These posts are for the Karaikal Campus of JIPMER located at Karaikal-609602. The vacancies are in the Department of General Medicine, Microbiology, Obstetrics & Gynaecology, Pathology, Pharmacology, Anatomy, Anaesthesiology, Biochemistry, Community Medicine (P & SM), Dentistry, ENT, Forensic Medicine and Toxicology, General Medicine, Microbiology, Obstetrics & Gynaecology, Ophthalmology, Orthopaedics, Paediatrics, Pathology, Pharmacology, Physiology, Psychiatry, Pulmonary Medicine, Radio-Diagnosis, Skin & STD (Dermatology), Surgery. 1. A Medical qualification included in the I or II Schedule or Part II of the third Schedule to the Indian Medical Council Act of 1956 (persons possessing qualifications included in part II or third schedule should also fulfill the conditions specified in Section13 (3) of the Act.). 2. A Postgraduate qualification, in the concerned discipline/subject. Fourteen years teaching andfor research experience in a recognized institution in the concerned discipline after obtaining the qualifying degree of essential qualification. 1. Post Graduate Qualifications, i.e. Master’s Degree in Pharmacology or allied subjects. 2. A Doctorate (Ph. D) Degree from a recognized University/ institute. Fourteen years’ teaching and/ or research experience in recognized institution in the concerned discipline after obtaining the Doctorate Degree. 2. A Post graduate qualification, in the concerned discipline /subject. Three years teaching and / or research experience in a recognized institution in the concerned discipline after obtaining the qualifying degree of essential qualification. 1. Post Graduate Qualifications, i.e. Master’s Degree in concerned or allied subjects. 2. A Doctorate (Ph. D) Degree from a recognized University 1 institute. Three years’ teaching and / or research experience in recognized institution in the concerned discipline after obtaining the Doctorate Degree. Assistant Professor– Not exceeding 50 years as on closing date i.e. 01.05.2019. Professor– Not exceeding 58 years as on closing date i.e 01.05.2019. Assistant Professor: Level 12 (101500 – 167400) as per 7th CPC with minimum pay Rs,1,01,500/- per month and other allowances as admissible. Professor: Level 14A (159100 – 220200) as per 7th CPC with minimum pay Rs.1,59,100/- per month and other allowances as admissible. Note:- The numbers of vacancies are subject to variation. Of the 55 posts of Assistant Professor, 4 % (i.e. 2 posts) are reserved for Persons with Disabilities (Pw[)) – OPH category. Essential Qualifications: Essential is as same as Professor mentioned above. Experience for Post Code: Ten years teaching and, or research experience in a recognized institution in the subject of specialty after obtaining the qualifying degree of MD/MS or a qualification recognized equivalent thereto. Relaxation for CBC I SC / ST / Ex-servicemen I Persons with Disabilities / Government servants is admissible as per rules. Other details regarding pay scale, age, qualification, reservation details, experience, how to apply etc. are available at the JIPMER websites www.jipmer.puducherry.gov.in and www.jipmer.edu.in.